A zombie is a creature that appears in books and popular culture typically as a reanimated dead or a mindless human being. Stories of zombies originated in the African Caribbean spiritual belief system of Voodoo, which told of the people being controlled as laborers by a powerful wizard. According to the tenets of Vodou, a dead person can be revived by a bokor, or sorcerer. Zombies remain under the control of the bokor since they have no will of their own. "Zombi" is also another name of the Vodou snake lwa Damballah Wedo, of Niger-Congo origin; it is akin to the Kikongo word nzambi, which means "god". 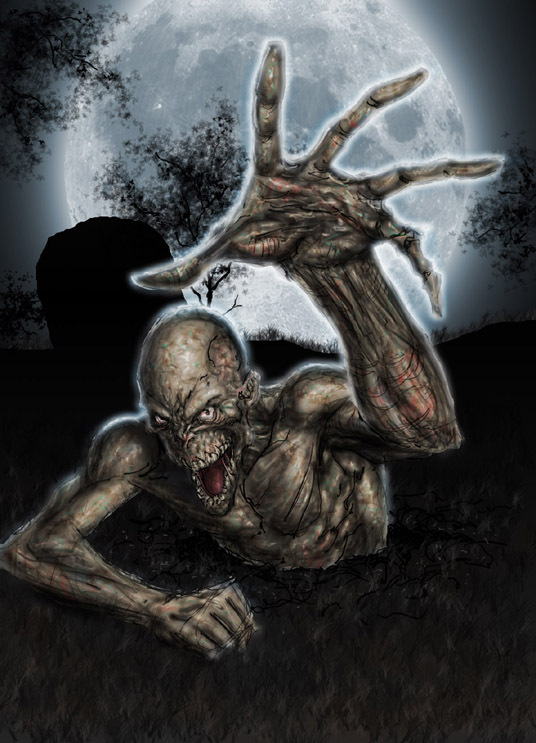 There also exists within the West African Vodun tradition the zombi astral, which is a part of the human soul that is captured by a bokor and used to enhance the bokor's power. The zombi astral is typically kept inside a bottle which the bokor can sell to clients for luck, healing or business success. It is believed that after a time God will take the soul back and so the zombi is a temporary spiritual entity. Several decades later, Wade Davis, a Harvard ethnobotanist, presented a pharmacological case for zombies in two books, The Serpent and the Rainbow (1985) and Passage of Darkness: The Ethnobiology of the Haitian Zombie (1988). Davis traveled to Haiti in 1982 and, as a result of his investigations, claimed that a living person can be turned into a zombie by two special powders being entered into the blood stream (usually via a wound). The first, coup de poudre (French: 'powder strike'), includes tetrodotoxin (TTX), the poison found in the pufferfish. The second powder consists of dissociative drugs such as datura. Together, these powders were said to induce a death-like state in which the victim's will would be entirely subjected to that of the bokor. Davis also popularized the story of Clairvius Narcisse, who was claimed to have succumbed to this practice. Davis's claim has been criticized for a number of scientific inaccuracies, including the unlikely suggestion that Haitian witch doctors can keep “zombies” in a state of pharmacologically induced trance for many years. Symptoms of TTX poisoning range from numbness and nausea to paralysis, unconsciousness, and death, but do not include a stiffened gait or a death-like trance. According to neurologist Terence Hines, the scientific community dismisses tetrodotoxin as the cause of this state, and Davis's assessment of the nature of the reports of Haitian zombies is overly credulous.